Lingayat Religion - Legitimate or Divisive? HomeSouth IndiaLingayat Religion - Legitimate or Divisive? Lingayats and Veerashaivas are a community of people present in Karnataka, Maharashtra, Andhra Pradesh and some parts of Tamil Nadu. 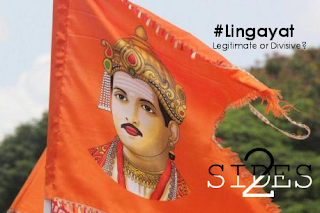 Formed in the 12th century under the philosopher reformer Basavanna, the main motto of Lingayats are supremity of Shiva and Dignity of labour. The Lingayats and Veerashaivas are now considered as a caste under Hinduism. The Karnataka government under Chief Minister Siddaramaiah has approved a separate religion status for Lingayats and will forward a recommendation for the same to the Centre. Lingayat was born as a reaction to the Brahmanical Hinduism and its oppressive customs and traditions. Under Basavvanna's teachings, Lingayats emerged by negating the very fundamental principles of the then existing form of Hinduism. Caste, Brahmanical supremacy, systematic subjugation of women, shrutis and smritis were all rejected by the Lingayats, effectively nullifying the existing Sanskrit traditions. Further, they are also a monotheistic religion worshipping only Shiva and his superiority as opposed to Hinduism which is polytheistic. The Veerashaiva and Lingayat movements are essentially reformist in nature, breaking away from traditional Hinduism. Jainism, Buddhism and Sikhism, these religions all followed a similar origin - reformers rejecting the existing flawed form of Hinduism to create a new religion. Thus, it is only natural for the Lingayats to demand a separate religion to assert their identity, especially in these times of growing Hindu communalism masquerading as nationalism. In fact, the demand for a separate minority religion has been making the rounds since the 1980s, but no government had yet been bold enough to take a concrete stance on this legitimate issue of a large section of the population. The Congress government has done a commendable job of the same. The decision to recommend a distinct religious status for the Lingayats follows the recommendations in the report submitted by the Justice Nagamohan Das committee, set up specifically to study the separate religion for Lingayats issue. A group of Lingayat seers had met Chief Minister Siddharamaiah on Saturday and had requested him to implement the committee report. The CM's decision now has received many commendations from the Lingayat community. Thier "fight is 900-years-old but has fructified now", said Todarya Math’s Lingayat seer Siddalinga Swami. The Lingayats form a sizable form of the Karnataka electorate at more than 17% of its population, and Karnataka goes to the polls in a little more than a month. The government, and thus the Congress party, is actively trying to implement their divide and rule policy which had subjugated Indians and Hindus in the country for more than half a century since independence. The decision of the government on the Lingayat issue before the Moral Code of Conduct kicks in nothing more than a blatant form of communalism and is a politically motivated decision. The Karnataka government has been following a heavily divisive mandate for the past few months - with the anti-Hindi protests, followed by the separate state flag and now the Lingayat issue. No government should have the power to bifurcate a religion to suit their political needs. Declaring Lingayats as separate from Hinduism is similar to if the government had declared Shias as separate from Islam or Protestants from Christianity. It is a decision that is alarmingly against the very fabric of India and its constitution, and is sure to open a Pandora's box of communal issues. Lingayat strongman and state BJP chief B S Yeddyurappa has said that his party would not allow efforts to "divide" the community. In fact, the Siddaramaiah government game plan to derail the rising BJP tide in the state seems to be to bring up highly divisive issues and place them at the doorstep of the Centre. Accepting or rejecting these proposals - Lingayat religion, Karnataka state flag etc - would both be a blow to chances of the BJP in the state. Thus it is a catch-22 for the BJP and a win-win situation for the Congress. With an intention to gain political mileage ahead of the polls by dividing society, this decision by the Siddaramaiah government is nothing more than dirty politics played by the Congress. It is a very shameful and cowardly act by a party that has almost been entirely wiped out of India.